Apple Co-Founder and CEO Steve Jobs opened the Apple Worldwide Developers Conference in San Francisco, California. Jobs, who has been on medical leave since January, received a standing ovation. This session was about software: OS X Lion, iOS 5, and iCloud. OS X Lion will only be available in the Mac App Store for $29.99. Will be available for consumers in July 2011.
iOS 5 will ship to all customers this autumn 2011 and be available for iPhone 3GS, iPhone 4, iPad, iPad 2, iPod Touch (3rd and 4th generation). 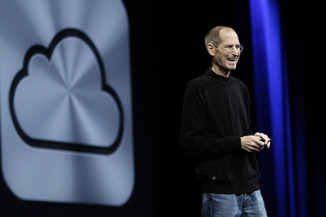 iCloud Becomes Your Digital Hub Apple Co-Founder and CEO Steve Jobs introduced iCloud. "We're going to move your digital hub, the center of your digital life, to the cloud." This includes documents, photos, video, music, etc. which will be automatically uploaded to iCloud and synced to the other iOS devices. The iOS devices, e.g. iPhone, iPad, iPod Touch, Mac, will be devices linked to the cloud, iCloud. Steve Jobs explained, "iCloud stores your content and wirelessly pushes it to all your devices. So it automatically uploads the content, stores it, and automatically pushes it to all your other devices. Also, iCloud is integrated with your apps, so everything happens automatically. There is nothing new to learn. It just works." ● Contacts, calendar, calendar sharing, and mail are synchronized with each iOS device via iCloud and are now free (formerly on MobileMe for $99 a year). ● Three more apps will be in iCloud: App Store, iBooks, and Wireless Backup to iCloud. There will be automatic daily backups to iCloud over WiFi including purchased music, apps, and books, photos and videos, device settings, and app data. ● Three new apps and features will be in iCloud: Documents in the Cloud (Pages, Numbers, and Keynote), Photo Stream (synced to Apple TV), and iTunes in the Cloud. Roger Rosner, VP of iWork, gave a demonstration of how iWork works with iCloud. Eddy Cue, VP of Internet Services, gave a demonstration of Photo Stream and iTunes in the Cloud. ● These 9 apps constitute iCloud: Contacts, Calendar, Mail, App Store, iBooks, Wireless Backup, Documents in the Cloud, Photo Stream, and iTunes in the Cloud. All are free. ● iCloud setup is on iOS 5. 5GB free storage for Mail, Documents, and Backup and not counting against storage for purchased music, apps, or books or Photo Stream. iTunes in the Cloud beta is available now via iOS 4.3. The entire iCloud will be available with iOS 5 this autumn 2011. Apple - 2011 WWDC Keynote Address ﻿OS X Lion, iOS 5, and iCloud unveiled at the 2011 Apple Worldwide Developers Conference in San Francisco.